Visual Studio Code>Programming Languages>Azure IoT Hub ToolkitNew to Visual Studio Code? Get it now. 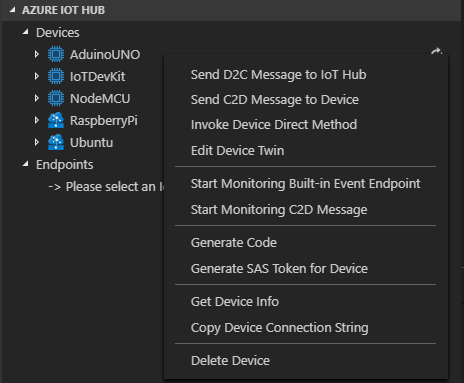 In Explorer of VS Code, click "Azure IoT Hub Devices" in the bottom left corner. Click "Set IoT Hub Connection String" in context menu. An input box will pop up, then enter your IoT Hub Connection String (It is one-time configuration, and please make sure it is IoT Hub Connection String not Device Connection String. The format is HostName=<my-hub>.azure-devices.net;SharedAccessKeyName=<my-policy>;SharedAccessKey=<my-policy-key>). The device list will be shown. 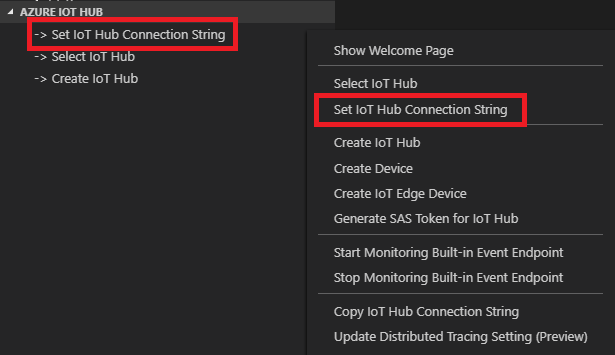 NOTE: You could also go to File > Preferences > Settings (Code > Preferences > Settings on Mac), update the config of azure-iot-toolkit.iotHubConnectionString to change your IoT Hub Connection String. 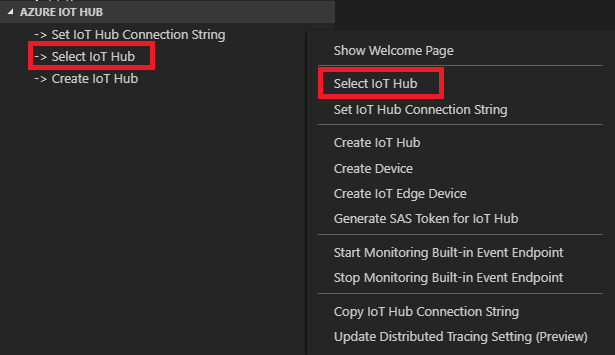 Instead of copying and pasting to set IoT Hub Connection String, you could sign in to Azure to select IoT Hub from your Azure Subscription. Click "Select IoT Hub" in context menu. If you have not signed in to Azure, a pop-up will show to let you sign in to Azure. After you sign in, your Azure Subscription list will be shown, then select an Azure Subscription. Your IoT Hub list will be shown, then select an IoT Hub. After code snippet is created, you need to install corresponding npm package (e.g. azure-iot-device-mqtt) to run the code snippet. If you want to 'Run Code' directly, you need to install Code Runner.